Columbine Falls sprints over the granite rocks and boulders of the high country on it's downhill journey. The sun has just begun to peak over the Twin Sisters formation on a sublime morning in Rocky Mountain National Park. 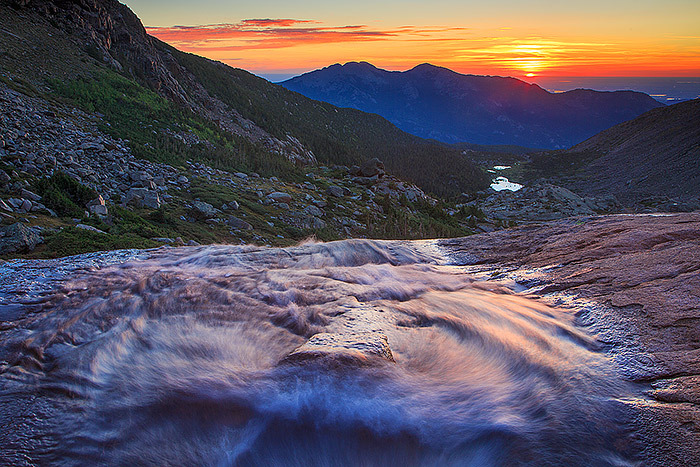 The orange and red hues of sunrise reflect in the rushing waters of Columbine Falls just below Longs Peak. Columbine Falls resides at the base of Longs Peak, Rocky's highest peak making it one of the most dramatic waterfalls in all the park. Photo © copyright by Thomas Mangan.